Jacob the Jeweler, king of bling, got sued by Cartier. In short, Jacob the Jeweler bought Cartier watches without ice (diamonds) and iced them all by himself. Cartier doesn’t like it when people modify their watches ofcourse, especially not when only the gold versions of their watches are originally studded with diamonds. Icing the stainless steel versions, make the watch a lot cheaper ofcourse. According to Cartier, these watches “cannot properly be called ‘Cartier’ watches”. 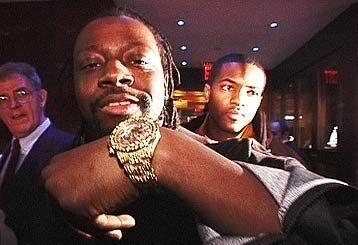 Rapper Wyclef Jean with his iced-out watch. Do these guys have no taste at all?